Tension. The act or action of being stretched. Opposite force from Bind. Tension causes throwback, splitting, barber chairing. Third Facing Cut. Special technique for making an "extra" facing cut to promote a proper undercut (face). Root protrusions, cat-faces, and rot are some of the common conditions that require a third facing cut. Throw back. Ground debris, limbs or tops thrown back toward the faller as the tree falls to the lay. Top Bind. One of the five basic tree positions commonly encountered while bucking. A log in a top bind situation is compressed on top and tensioned on the bottom. Undercut (Gunning or Face Cut). The horizontal cut made in completing the conventional or Humboldt technique. Also, general term applied to the combination of the gunning cut and sloping cut. USFS. United States Forest Service. Wedge. A plastic or magnesium tool used by a faller to redistribute a tree's weight to a desired direction (lift) and to prevent a tree from sitting back. Also used to prevent the guide bar from being pinched while bucking. Widow-Maker. 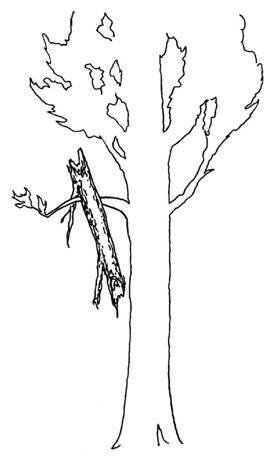 A loose limb or top or piece of bark lodged in a tree, which may fall on anyone working beneath it. Windfall. 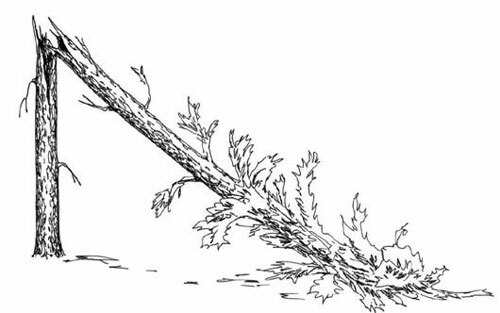 A tree that has been uprooted or broken off by the wind.